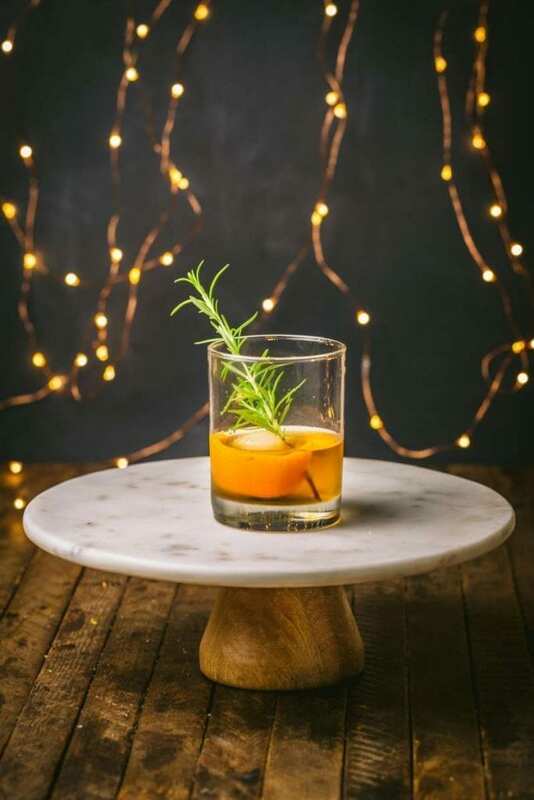 As the weather turns chilly, we want a cocktail that will warm our cockles, and this Spiced Rosemary Old Fashioned is the perfect drink to take us straight through the holiday season. We took Heritage Distilling’s Elk Rider Rye and mixed it with a syrup flavored with maple, cinnamon, star anise, black pepper and rosemary. It makes you feel like you’re sitting next to a roaring Yuletide fire, even if it’s still October. Don’t want the same old miserly chocolate slabs in your advent calendar this year? Don’t worry, our pals at Heritage Distilling have you covered. 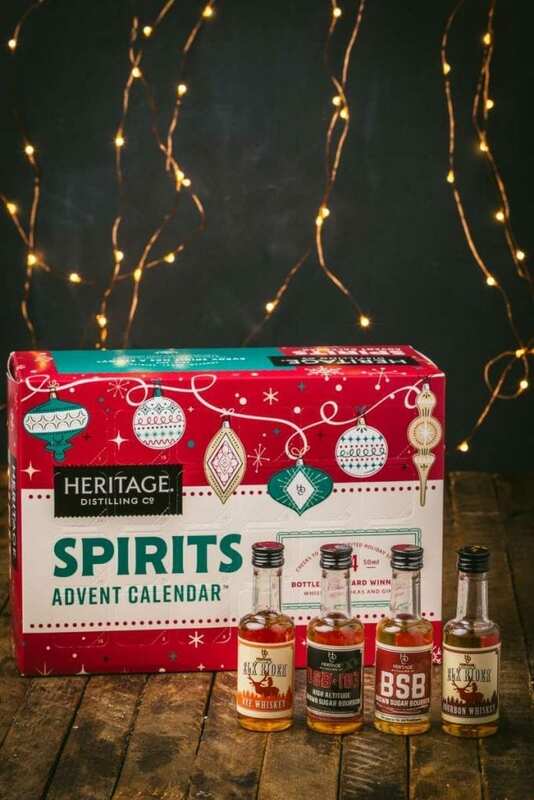 If there’s one thing we know how to do, it’s drink – so we couldn’t be happier to try out their 2018 Spirits Advent Calendar, with enough mini bottles of bourbon (or other spirits) to make it through to Christmas Eve. We used the spicy, peppery Elk Rider Rye in our cocktail, but it would be equally good with Elk Rider Bourbon. You also get to try our other favorite, the Brown Sugar Bourbon, which we love on the rocks (or in our version of a Whisky Sour). Look for that recipe, and other cocktail suggestions at the bottom of this post. The spiced syrup: cinnamon, star anise, black pepper, rosemary and maple. Our simple syrup is packed with the flavors of rosemary, cinnamon, star anise, pepper and maple. This sweet, herbal infusion pairs perfectly with a smooth bourbon or rye, and just a dash of citrus in the form of orange bitters. 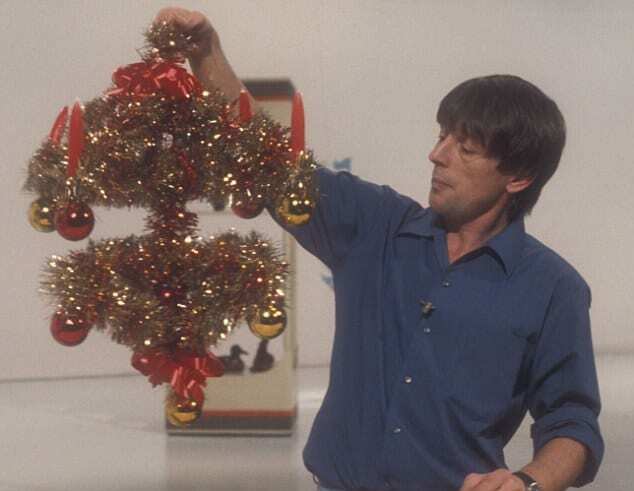 The ineffable John Noakes showing off one of his homespun creations. Kids who scoffed at manual labor or who simply weren’t allowed near the sharp scissors quickly upgraded to store-bought chocolate-based calendars. You’ve probably got one in your house right now, ready to go, admit it. I’ve nothing against chocolate – quite the reverse – but the appeal in tearing off a little tab every day to find the same tiny sweet sliver and perhaps a nice picture of a fir tree in a snowscape does tend to pall halfway through the month. But what if there was a better way? An advent calendar with something more of a grown-up reward for tearing off the little flaps? Something a little more – may I say “spirited”? (ho ho) WELL NOW THERE IS. 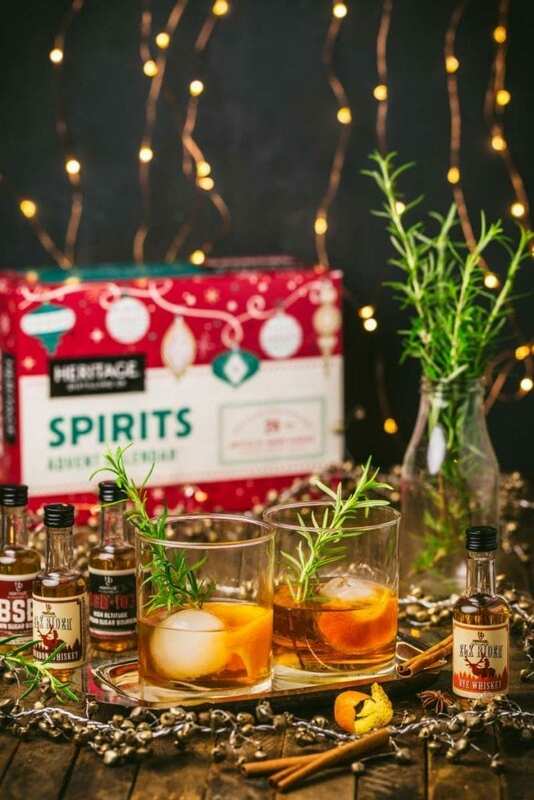 We have our friends at Heritage Distilling to thank for pointing us toward their 2018 Spirits Advent Calendar. No mean sliver of chocolate here – behind each daily door is a 50ml bottle of one of their excellent spirits. Did someone say “Whisky flight”? Cos I’m pretty sure I heard it. In most locations they ship to, you should expect to get a selection of bourbons, ryes, vodkas (some flavored) and gins. If you live in New York state, like us, you’ll get a great selection of their bourbons and ryes. Either way, there’s enough inspiration to put together a new cocktail every day of the holidays! And what can you make with their spirits? Well, Heritage has a great selection of suggested cocktails over at their site. While you’re there, did we mention that we have a special discount code of $10 off the price of every calendar you order? Use code NERDS10 (that’s NERDS followed by the number 10) when you checkout. But we also have a drink for you! We’re calling this a Spiced Rosemary Old-Fashioned. We also have a selection of past whisky cocktails for your holiday drinking pleasure. The Monarch! Our favorite way to drink Brown Sugar Bourbon. Add thyme, lemon, elderflower liqueur and an egg white and you have an elegant and supremely sippable drink. Rosemary, Baby! A marriage of bourbon and aperol infused with rosemary and grapefruit. Make it at Hallowe’en because of the name, keep making it through the rest of the winter because the world is a scary place. Cranberry Sauce Whisky Cocktail – we never did think up a clever name for this. Maybe you can? It does what it says on the tin. Helps you get through Thanksgiving with your sanity mostly intact. Vanilla Old Fashioned – warms your cockles when your cockles needs warming. Nuff said. Add all the syrup ingredients to a small saucepan set over medium heat. Bring to a simmer and stir until the sugar has dissolved, about 2 minutes. Turn off the heat and allow syrup to cool completely. Once cool, strain and transfer to an airtight container. Syrup will last in the refrigerator for up to a month. 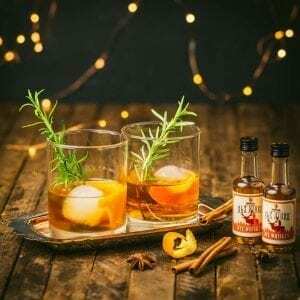 Add the whiskey, spiced rosemary syrup, and bitters to a rocks glass. Add ice and stir for about 30 seconds until the drink is fully chilled. Garnish with a rosemary sprig and an orange peel.